Warm spices and orange zest make this trail mix especially comforting. Some of my fondest childhood memories are of camping in the summers with my family. I remember one trip in particular, when we drove up to the UP (the Upper Peninsula in Michigan) and camped near a small bay off of Lake Superior. I don’t remember how long we stayed – probably a few days – but looking back on it now, it seems like we spent the whole summer there. During the day we would kayak or fish, and at night we would sit around the campfire roasting marshmallows and singing campfire songs. “Down by the Bay” was my favorite, and my Dad would make the silliest rhymes and send us into fit after fit of the giggles. Have you ever seen a panther who didn’t know the anther? Down by the bay. It was absolutely perfect. If you ask me, one of the best things about camping is the food. Why does everything taste better when it’s cooked outside over a fire? A simple can of beans, or some fried potatoes, and you have a meal that not only tastes delicious but makes you wonder why you would ever go back to the city when everything you need is right here. Maybe you should just live here, in the middle of nowhere, with nothing but a tent and a fishing pole and definitely not a smartphone. Really, I think camping food is the ultimate comfort food because it makes you feel so, so good exactly where you are. This recipe is a little bit like that, too. It’s perfect for eating outside in a quiet place, somewhere along a trail or by the side of a lake. Hopefully you’re not in a hurry, and can just relax for a bit and enjoy this tasty snack. 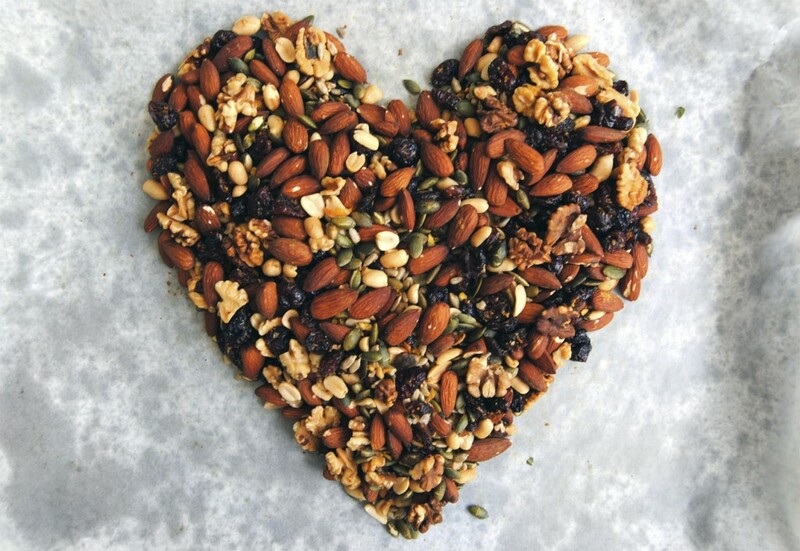 This trail mix is awesome just the way it is, but it’s also totally customizable. You can add any variety of nuts and seeds to this, as well as any sort of dried fruit. In fact, after I had already taken the pictures, I remembered that I had some dried apricots in the cupboard, so I chopped them up and added them to the mix. I’m so glad I did! Banana chips would also be great, or dried coconut. If you like chocolate in your trail mix, some dark chocolate chips would be perfect. Preheat the oven to 350ºC. Toss the nuts and seeds with cinnamon, nutmeg, sea salt and orange zest. 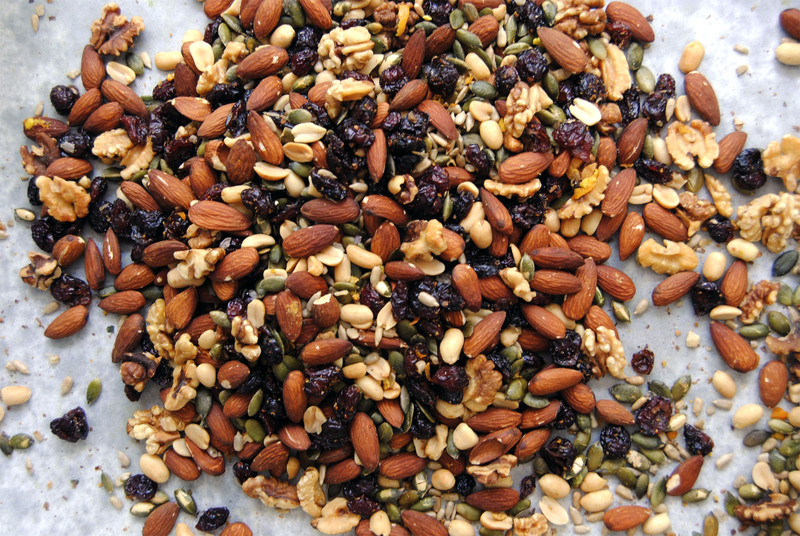 Roast for 10-15 minutes, stirring often to make sure the nuts and seeds don’t burn. When everything is nice and toasted, take it out of the oven. almost therapeutical. I just know it is going to taste AMAZING! Wow, thanks for visiting and for your comment! It does smell amazing, doesn’t it? Hope you enjoy it!